A good mountain bike is one that doesn’t simply get riders from point A to point B. That is the job of a commuter’s bike. Instead, these mountain bikes need to provide a more responsive performance in tougher terrain. This means that these bikes need the best possible specification for the job. They need the right tyres, brakes, gears, frame and suspension. This is the only way to make the turns and handle the grit in a safe, comfortable and controlled manner. Each model differs in its overall spec, but they all have features in common. There are many mountain bikes from the brands listed below that can all look quite similar on face value. The frames may come in a variety of sizes and colours, but they generally have a similar make-up. Once consumers look a little closer, the differences become clear. The grip on the tyres is important for traction on the trail. The brakes have to be responsive, so many riders favour hydraulic disc brakes. The gear system comes in a range of speed options. Some are a low as 10 and other as high as 27. Then there is the geometry of the frame and its weight. Is it light enough for a fast time? It is also important to consider different types of mountain bikes others than a “typical” men’s model. There are some that are designed with teens and junior users in mind. This means a good all-round performance for less experienced users. Then there are the 29ers for the experienced riders that want to up their game a little. There are also full suspension bike for those that like to attack the tracks. The following bikes are 10 top rated models with different aims and specifications. The name Vengeance suggests something tough that isn’t going to back down from a challenge. That is precisely what buyers can expect thanks to the great blend of components and the high quality build. Many riders will appreciate the balance between the lightweight aluminium frame and the large, strong 27.5’’ wheels. The benefits continue with the reliable front suspension, braking and general handling. An added benefit with this bike is the fact that it is one of the more affordable models. This wont break the budget, yet still has all those top features such as the 24 speed Shimano gear system and the Tektro Aries mechanical disc breaks. There are also some helpful extras like the quick release wheel that some may not expect. There is still room for upgrades, such as the pedals and saddle, but it is a nice entry-level mountain bike. Voodoo mountain bikes are often out to impress onlookers as much as their riders. There is something about the shape and detail on these bikes that appeal to many riders. This model, along with many of the Voodoo options below, has slack geometry, reflective artwork and some nice attention to detail. The black and orange of this Bantu is especially striking. There are also some standard Voodoo components in the seatpost, saddle and grips. Still, there is more to this trail bike than the design. There are also plenty of great elements to the specification to help users off-road. This is a pretty lightweight bike, with its 7005 aluminium frame, that can zip along the courses with its 18 speed Shimano Altus gearing system. This combines with the strong 27.5’’ wheels, responsive hydraulic brakes and Suntour fork for a great ride. Carrera’s Vulcan model is one built with speed in mind. While the model above aims to provide a great introduction and all-round appeal, this model focuses on quick motions and reactions. To begin with, there is the extra speed from the 27 Speed Shimano gearing system. These gears allow for great transitions between speeds so more experienced users can really pick up the pace on the trails. This is great for those that want to shave a little time off a personal best. These improved times also come from the strong handling and braking. There is also speed in the response times for ease of movement on the course. These hydraulic brakes are said to be ideal in wet conditions, and the large 27.5’’ wheels help too. When we add in the extras of the alloy frame and great front suspension there is clearly a lot to love. Like the final model in the Voodoo range above, this is a 29er bike with those extra wide wheels for greater stability on the trails. Those wheels have that great combination of Mavic XM319 aluminium rims and reliable Continental Mountain King tyres for great weight and handling. It is all about the control offered to riders, which allows them to push a little harder and get the result that they want. Riders can approach the trails at speed, with the SRAM 1×11 GX gear and hydraulic disc brakes. A lot of this control also comes down to the geometry on the frame and the forks. There is an adaptive suspension fork with rebound and compression damping. That frame also comes in a great range of sizes – from the 16’’ frame up to the 20’’. This means that most riders should find the right fit. The main drawback with all these considerations is that the price of this model is significantly higher than the budget bikes above. While the Vulcan appears to be better suited to the wetter conditions and fast time trials, the Kraken has great potential in many conditions. Despite being named after a giant sea monster, this is a compact little beast that thrives on dry trails and high altitude. The light weight comes from the frame, which has 7005 aluminium tubing. The grip from the Continental X-King tyres on the 27.5’’ wheels, and the handling, allow for peace of mind on dustier tracks. This is therefore a bike that screams confidence, something that is also clear from the bold red and black design. Other features of note with this model are the Shimano hydraulic brakes and Acera 27 speed gears – so riders can really attack the session – and the 120mm Suntour Front suspension. The latter has a helpful lockout feature to improve the performance further. This is something to look out for in many top rated mountain bikes. This Voodoo Hoodoo bike brings together many of the great features that buyers expect from the brand, in a mid-range price point. The look of this bike is similar to the Bantu above. There is a nice use of slack geometry on the bold orange/red frame with its yellow branding. This contrasts with the black of the Voodoo seat, handlebars, pedals and the reliable Maxxis Ardent tyres on those 27.5’’ wheels. A feature that stands out with this model is the light weight. At around 14.1kg, this can be as much as a kg lighter than some other Voodoo bikes. The weight comes from the use of the 7005 alloy frame and rims. This light weight is helpful for those travelling to a favoured trail – as is the use of the quick release wheels on both the front and back. Other features with this 10 speed bike include the Shimano M395 hydraulic disc brakes and Suntour XCR32-AIR LO front suspension. When compared side by side with the mighty Kraken, the Carrera Valour doesn’t seem to have quite as much impact. There are plenty of great components in place, but not with the same performance. The wheels are the same size, with the much-loved Kendra tyres seen in other models. There is a 24 speed system, rather than 27, that again comes from Shimano. There is also a simple suspension fork and braking system. However, all this simplicity is ideal for this teen+ bike if buyers view it as an entry-level, budget option for teenage boys. There is enough here to offer a comfortable, secure ride without going over the top. The designers focused on what mattered most for the demographic. That is where there are so many great frame size options, a light weight from all the aluminium and dual quick release wheels. The attractive blue and green design is a nice touch too. A full suspension mountain bike is a great choice for those that want to ride hard with comfort and peace of mind. As you have seen from the models above, there are lots of top-of-the-line mountain bikes that focus on the front fork. This is a great example of a top rated mountain bike with the build and components to handle some rough treatment. There is a Suntour Raidon 34Boost LOR-DS fork and Suntour DuAir LOR rear shock for a comfortable ride. This dependable suspension system pairs up brilliantly with the rest of the bike for a great ride. This is only a 10 speed bike, so doesn’t have the speed of some of the other options. Yet, there are great responses in the gear system, the 180mm rotor brakes and the 27.5 inch wheels. This is a great specification at a higher price tag. The final option here from Carrera is the Fury mountain bike. This time we have a product deliberately sold as a juniors bike. This would suggest something with a lesser specification than some of the men’s bike above. However, this smart-looking model is also the most expensive, and this is the result of an impressive list of components. The gear system isn’t quite as extreme as on other Carrera models, because it doesn’t need to be at this beginner level. Still there is a SRAM NX 1×11 system that works well enough for newcomers. This combines with the Avid DB-1 hydraulic disc brakes, Suntour Raidon XC fork and Continental X-King tyres for a great performance. There is also the addition of the light frame, a lockout on the adjustable forks and quick release wheels. These little touches are a pleasant surprise in this bike. They show that while this bike is for younger riders, it is more than a short-term stepping stone product. 29ers are a popular choice with many rider. That is why is it is no surprise that Voodoo offer such a model to those that favour the approach. The wheels and the tyres are the star of the show here. These large wheel and Maxxis Ardent tyres offer the traction and ease of movement that riders need. There are even many teenage users getting to grips with the style for the first time that love the feel of the bike. Even so, there are still plenty of other components on board to help users achieve the performance that they need. The ease of handling and control also has a lot to do with the braking and shape of the frame. Voodoo are keen to highlight the use of slack geometry on this bike, and many riders say that it makes a difference. The bike also boasts Shimano Deore 160mm rotor brakes, a Sram 1 x 11 drivetrain and 6061 aluminium frame. These top rated mountain bikes show that there is a lot to consider when choosing a product. Some of them are designed a little more with speed in mind. This means a light frame, good braking and plenty of gears to choose from. Others focus on the comfort on rougher terrain, with either quality front suspension or full suspension. Then there are those budget all-rounders that offer a good starting point for new riders. The main components make or break the bike in terms of its worth. The little details like the colours, grips and quick release wheels just increase the appeal. The choice mostly comes down to the main reason for buying the bike in the first place. Consumers can’t be distracted by interesting details if they don’t suit their needs. 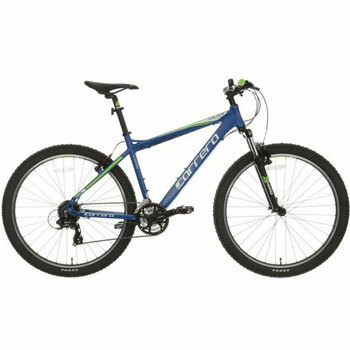 This means a more simplistic, competent bike for newcomers unsure about mountain biking, or a finely-tuned 29er for those in need of an upgrade. It means looking at speed, comfort or handling as a priority based on the final goals. Those that focus and compare bikes wisely will find the best option.